It can be kind of hard coming up with things that start with j. Of course, if you ask your kids they’ll probably come up with jelly and jelly beans … all the sweet stuff! Here’s a nice selection, granted it does have jam and jelly beans, but those are just the beginning. 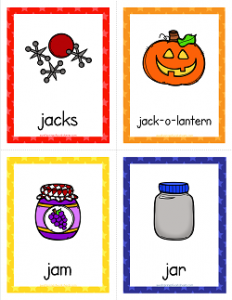 Here’s the full list: jacks, jack-o-lantern, jam, jar, jeans, jelly beans, jelly fish, and juice. These also have a nice title page card you might like to use.